The story of Samson and Delilah has been told many times on film, TV and the stage with an opera. The list is pretty long but here are some of the most memorable or known productions. Of course the 1949 version directed by Cecil B DeMille is the most famous one. Bodybuilder Steve Reeves auditioned for the role but DeMille thought Reeves' body was too sculpted and the future Hercules didn't get the part. The classic 1949 version with Hedy Lamarr as Delilah and Victor Mature as Samson. 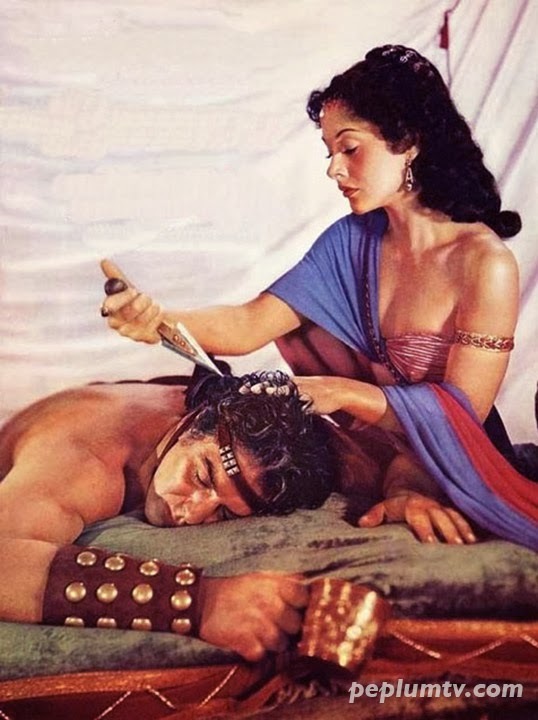 Samson (Anton Geesink) has been rendered weak by Delilah (Rosalba Neri) after she and an assistant cut his hair in one of two short films in GREAT LEADERS OF THE BIBLE (1965). Antony Hamilton and Belinda Bauer are Samson and Delilah in this 1984 TV version. Both actors were miscast. Elizabeth Hurley and Eric Thal in the 1996 version of the fabled story. Unlike other productions, Delilah cuts Samson's hair while he's wide awake, as a dare of sorts. This scene is pretty good even if the final product is uneven. Anthony Hamilton died way too young. Perhaps that show "Cover Up" was cursed. Both Hamilton and Jon-Erik Hexum died at a young age.